If you look at a map of the head of Lake Ontario and the waterfront of the City of Hamilton, you’ll find several distinct features. From east to west, you’ll first find a narrow strip of land where the Burlington Skyway straddles the north and south shores of the lake, a high-speed transportation corridor for streams of daily motorists. 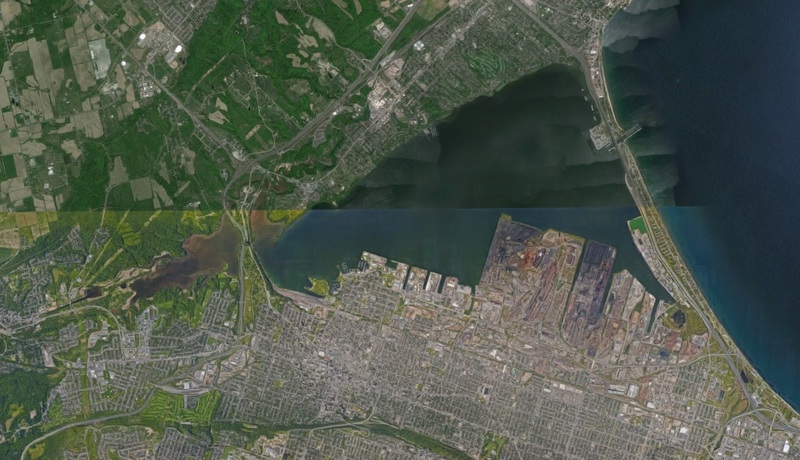 Moving west, you’ll see the enclosed harbour and Hamilton’s industrial waterfront, a rigid geometric set of squares and rectangles jutting out into the lake. Finally, the head of the lake is again segmented by a narrow strip of land where York Boulevard crosses from Burlington to Hamilton, enclosing a smaller bay to the west and the Cootes Paradise sanctuary. Hamilton Harbour. Source: Google Earth. The contrast between the sharp lines of the waterfront in the industrial harbour and the greenery of Cootes Paradise hints at part of the long, complicated environmental history of Hamilton Harbour. This is the subject of a new book by two history professors from McMaster University. Nancy Bouchier and Ken Cruikshank explore both the social and environmental history of Hamilton Harbour in their new book from UBC Press, The People and the Bay. On this episode of the podcast, Nancy Bouchier and Ken Cruikshank discuss their new book and ways of thinking about social and environmental history. Bouchier, Nancy B. and Ken Cruikshank. The People and the Bay: A Social and Environmental History of Hamilton Harbour. Vancouver: UBC Press, 2016. Kheraj, Sean. “Episode 53: The Social and Environmental History of Hamilton Harbour” Nature’s Past: Canadian Environmental History Podcast. 26 May 2016. ← Who Teaches Digital History in Canada?